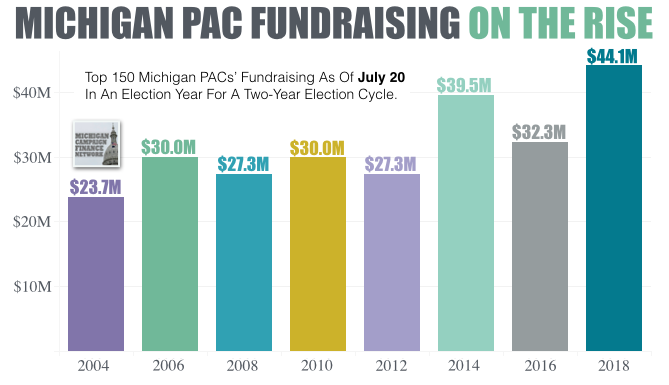 LANSING (AUG. 6, 2018) — Michigan’s political action committees — also known as PACs — are collecting more dough to spend on the 2018 election than they have for any past election. And it’s still not close. 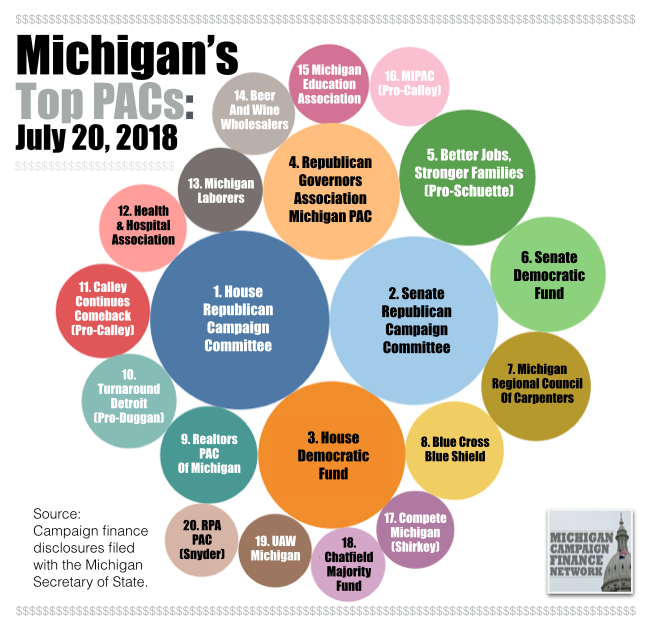 As of July 20, 2018, Michigan’s top 150 PACs had raised a record total of $44.19 million, according to an analysis of new fundraising disclosures. The previous high for Michigan PACs at this point in a two-year election cycle came in 2014 when they had gathered $39.55 million. The 2018 total is up 11 percent over the 2014 total. The 2014 election went on to produce Michigan’s second most expensive race for governor, its most expensive race for attorney general and its most expensive individual state Senate race. PACs can drive up the amount of money in elections because the wide majority of them are able to accept unlimited contributions from donors. They can spend unlimited amounts to help elect candidates as long as they do it independently of the candidates. If they want to give money directly to a candidate’s campaign, many of them can give 10 times what an individual person can give to a candidate. Most PACs are connected to interest groups, officeholders or supporters of candidates who want to influence election outcomes or future policies. Some past policies are helping PACs raise more money for 2018. In 2013, Michigan lawmakers voted to double the state’s campaign contribution limits so PACs can now give $68,000 per election to candidates for statewide office, $20,000 to candidates for the state Senate and $10,000 to candidates for the state House. Four of Michigan’s most active political committees are caucus committees, which raise money on behalf of the four legislative caucuses: the House Democrats; the House Republicans; the Senate Democrats; and the Senate Republicans. Under the new contribution limits, donors can now give $40,000 per year to a caucus committee. The cap used to be $20,000 per year. And the caucus committees have been raising a lot more money under the new limits. As of July 20, 2018, they had raised $10.18 million since the start of 2017. At the same point before the 2014 election — the last time all seats in the Senate and the House were on the ballot — they had raised just $7.26 million. Also, super PACs — PACs that can raise money directly from corporations and have to spend money independently of candidates — are playing a larger role. In 2017, the Legislature enacted a new law for super PACs, which allows candidates to raise money for them and allows them to share consultants with candidates they support. There are 19 super PACs on the new top 150-PAC list. At the same point before the 2014 election, there were only 15 on the list. Follow this link to download the list of the top 150 PACs in Michigan (spreadsheet and printable format). The following are additional findings from MCFN’s analysis of the PAC fundraising disclosures. The Republican Governors Association’s Michigan PAC was the state’s top PAC the last time Michigan elected a governor. The group re-established its RGA Michigan PAC in July, and the PAC reported raising $2.00 million before the end of the fundraising period, making it the fourth largest PAC. All of the money came from out of state, according to the disclosure. The PAC’s only reported expenditure was giving $1.00 million to the Michigan Republican Party on July 20. The three most active political committees have been the House Republican Campaign Committee ($3.41 million), the Senate Republican Campaign Committee ($3.02 million) and the House Democratic Fund ($2.31 million). The Senate Democratic Fund placed sixth at $1.42 million. The committees raise money year-round to pour into competitive races for the state House and state Senate before the general election. While the Republican committees have big fundraising leads for the election cycle, the Democratic committees posted slight advantages in fundraising in the last fundraising quarter between April 21 and July 20. The House Democratic Fund reported raising $616,947 last quarter while the House Republican Campaign Committee reported raising $432,730. The House Democratic Fund’s top donors last quarter included attorneys Mark Bernstein and Rachel Bendit of Ann Arbor, who gave $80,000, the Democratic Legislative Campaign Committee, which gave $40,000, the Singh Majority Fund, connected to House Minority Leader Sam Singh, which gave $40,000. The House Republican Campaign Committee’s top donors last quarter included the Republican State Leadership Committee, which gave $40,000, Nancy and John Kennedy of Autocam, who gave $40,000, and the Chatfield Majority Fund II, connected to House Speaker Pro Tem Lee Chatfield, which gave $40,000. The Senate Democratic Fund reported raising $351,349 last quarter while the Senate Republican Campaign Committee reported raising $286,051. Similar to the House Democratic Fund, the Senate Democratic Fund’s top donors last quarter also included Bernstein and Bendit, who gave $80,000 and the Democratic Legislative Campaign Committee, which gave $40,000. The Senate Republican Campaign Committee’s top donors last quarter included Matthew Moroun of Central Transport, who gave $20,000, and Michael Jandernoa, chairman of Perrigo, who gave $20,000. Of the top 25 most active PACs, four of them are super PACs. The super PAC supporting Attorney General Bill Schuette for governor, Better Jobs, Stronger Families, has now raised $1.9 million, making it the fifth most active PAC overall. According to its new disclosure, the super PAC received $150,000 from the nonprofit Fund for Michigan’s Tomorrows on July 13 and $125,000 from Mohammad Qazi, president of Ciena Healthcare, on April 22. The super PAC supporting Lt. Gov. Brian Calley for governor, Calley Continues Comeback, has now raised $948,561, making it the 11th most active PAC. It received $73,540 from Northwood Group CEO William Parfet on May 10. Parfet, a main financial backer of Gov. Rick Snyder, has now contributed a total of $323,540 since the super PAC launched. That’s more than a third of what the super PAC has raised. 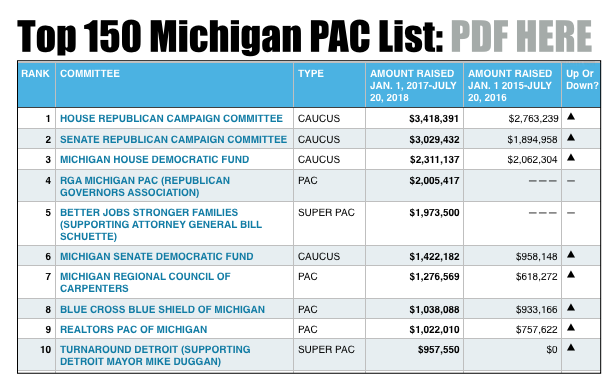 Two of the other most active super PACs have been Turnaround Detroit, which backed Detroit Mayor Mike Duggan in his 2017 re-election, and Business Leaders for Michigan PAC II. Turnaround Detroit has raised $957,550 while the Business Leaders for Michigan super PAC has raised $$452,500. Officeholders use leadership PACs to raise unlimited amounts of money and to support like-minded candidates and causes. Twenty-nine leadership PACs made the top 150-PAC list. The five highest ranking leadership PACs are Republican state Sen. Mike Shirkey’s Compete Michigan PAC ($646,716), Republican state Rep. Lee Chatfield’s Chatfield Majority Fund ($591,775), Republican Gov. Rick Snyder’s Relentless Positive Action PAC ($575,228), Republican Senate Majority Leader Arlan Meekhof’s Moving Michigan Forward Fund I ($371,458) and Republican House Speaker Tom Leonard’s Michigan Values Leadership Fund ($252,410). Chatfield, Meekhof and Leonard each had multiple leadership PACs on the top 150 PAC list.